The younger generation of Syrian refugees in Turkey: Forced to be precocious, but where does their future lie? The prolonged state of the Syrian civil war led to the huge outflow of Syrian refugees to its neighboring countries like Turkey, Lebanon, Jordan and Iraq. The registered number of the Syrian refugees inside Turkey is 1.5 million; however, the numbers could be more as most of the interviewees or Turkish officials told me that this number should be more than 2 million or even 3. The younger generation Syrian refugees not only been forced to leave their country, but also face the problems as drop out of schools due to security or economic reasons, lack of parenting, working illegally and got paid lower than the local average salary, and mentally and physically suffered because of their relatives or themselves’ misfortunes in and outside Syria. Even with their strong wills for surviving, how long can they stay on? And where are their future? The Syrian issue is not limited to the regional level, if the international society keeps on neglecting the refugees’ situations. The severe hatters towards the West and hopeless of their life in the minds of the Syrian people due to the careless of the international society may bounce back to the rest of the world. The following stories demonstrate how the younger generation of the refugees as Syrian youth living Turkey and their experiences reflect the iceberg of the hardship as an everyday experience. Many Syrian youths went abroad by themselves or with few friends, because their parents either had passed away due to the cruel civil war inside their country, or are too old to travel. Muhammad and two of his younger brothers is a case of this. Muhammad is 21, Ala is 20, and the youngest Hisham is only 16, they fled from Darra to Istanbul in the beginning of 2014. All they had was 6000 USD which their father gave them. Without having any acquaintances in Turkey, they have none to depend on but themselves. From finding a place to stay to looking for a job, they can only rest on themselves and their luck in this totally unfamiliar land. Even though the two older brothers have diplomas in computer design Syrian institutes, due to the language barrier, they can only work as restaurant services for earning a life. Even worse, their salaries is half of what the Turkish worker gets in Turkey (the normal salary in Turkey should be above 1500 lira but they were getting only 800 lira). Mahmoud’s salary of US$ 60 a month from a Lebanese fish factory helps to pay the rent for the underground storage room his family lives in (UNHCR/S. Baldwin / September 2013). The thing perplexing me most is, why a 16 year- old-teen would like to travel to an alien land for job with his brothers? He told me: when I was in school in Darra, the police or intelligence service will come to school and arrest the school children without any reason. Some of them return injured, some of them just disappeared. We cannot attend the class anymore due to the fear from this suppression. My parents were worried about my safety so they have no choice but ask me to leave with my brothers. I need to find a job here, for sustaining the economic problem faced by our family in Syria, because there is no working possibility in Syria now. Another 20 year old youth Muhammad from Aleppo, came to Istanbul with a few friends for finding a job. In Turkey, the Syrian people do not have the working rights, he worked as an illegal worker for construction. One day, he fell down from the second floor during his work, his back got injured and has to be bedridden for a week. I visited him with another friend in the hospital. When we entered the ward, we found three young men around his age were standing behind taking care of him, there were no adults to take care because all their parents are still in Syria. During his stay in Turkey, he got a call from his mother from Aleppo, the news from the other side of the phone was more painful than the injury on his back. His mother told him that his father has been arrested by the regime, and his brother has been detained by the rebels. Now he not only need to worry about his own situation, but also about his mother and sisters inside Syria: without any form of economic support and male members at home, how can they survive by themselves? He did not cry, not even a single teardrop, but unable to do anything he was just lying on the bed quietly. 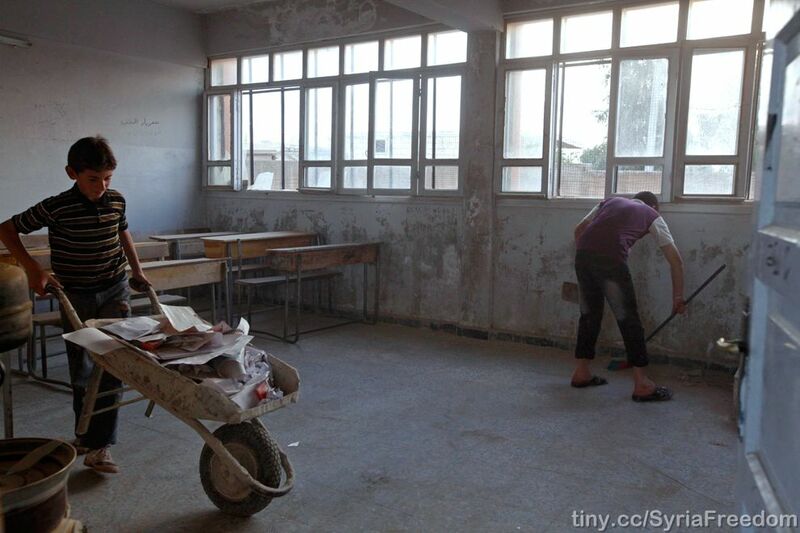 Children clean up their classrooms in a school damaged during fighting in Kansafra on October 6, 2012 (Zain Karam/Reuters). In Gaziantep, I met two friends from the rebel groups, Abdullah and Mustafa, 29 years old and 24 years old. The reasons for them to come to Turkey is not as the same as the other two cases, but because during the time of their fighting their family ran out of money, so they need to temporarily stay away from the battlefield for earning some money. They told me that many people are in the same situation as them, because they did not get paid for fighting. Even though they are working in Gaziantep as carriers, but what they are carrying more in their minds is the everyday bombing near their house in Syria. Another day I met Abdullah, his face looked pensive. He told me that a few minutes ago, 100 meter away from his house just got bombed, and his wife and children are crying through the phone on the other side. Even worse, two of his cousins got injured and been sent to the Turkish hospital for recovery. He told me that he did not know what to do, but can just try to comfort his family through phone. “The living cost here is too high for us, I cannot afford to bring my family here.” The next day I saw him, his face seems to be more serious than yesterday, and he told me that one of his cousin just passed away in the hospital. All the people mentioned in this article are interviewed by the author through his visit in the Turkish cities, Istanbul and Gaziantep during 2014 and 2015. This post was written by Ching-An Chang.